Offices usually aren't fun. They go along with work, bosses, boredom and lots of other unpleasant things. Fortunately, Chicago band by the name of Office is not like the rest. 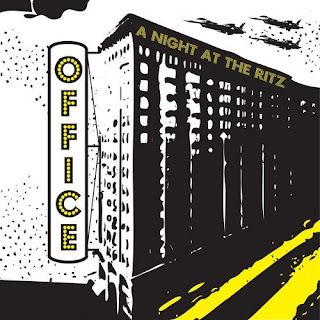 Their September 2007 release, A Night at the Ritz, is anything but dull, pairing irresistible melodies and poppy hooks galore with largely lovelorn lyrics. Office has been around for most of the decade, but began receiving widespread recognition in 2006 when their song Wound Up was designated single of the week in the itunes store and they played a set at Lollapalooza. Shortly after that they signed with New Line Records - a label owned by James Iha of The Smashing Pumpkins - and crafted A Night at the Ritz from a combination of new songs and songs culled from past releases, mainly their 2005 "demo" album, Q&A. The disc opens with the brief, stomping pop of Oh My and the jittery If You Don't Know by Now. These two songs make it clear you're about to listen to an album that you won't likely be able to get out of your head. Track three - The Ritz - contrasts a downright melodic, sing-song chorus with downright bizarre verses half-spoken by lead vocalist and songwriter Scott Masson to create one of the most interesting tracks. Other highlights include the straightforward, radio-ready Plus Minus Fairytale, the tried and true Wound Up and the lively power pop of my personal favorite, Paralyzed Prince. If you want catchy pop/rock with lyrical substance, you'll find much to love on A Night at the Ritz. Sample some sounds here and purchase it here.